Allie: they can be such a pain!! No! No boycats in the Trader Joe's bag! Sheesh. Allie: Boycats are outlawed from Trader Joe's, I'm sure! Hi there Allie, don't let those introooders get your bag. Good luck. Take care. Thanks so much for the birthday wishes. Allie, you sure have good taste. 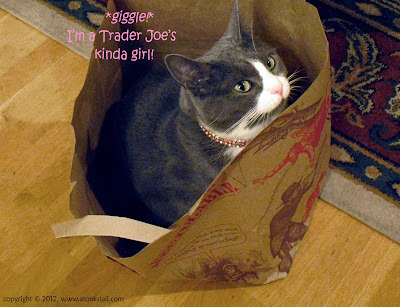 We love those Trader Joe bags (and the nommy things that come in them), too! Allie; *giggle* oh I let the peeps take the stuff inside - I claim the BAG! Nothing like a good bag to play in!!! Thanks for commenting on our blog. Nice to meet you! Allie: *waggles pink toenails in hello* HI!!!!! Allie, there are always party poopers!!! 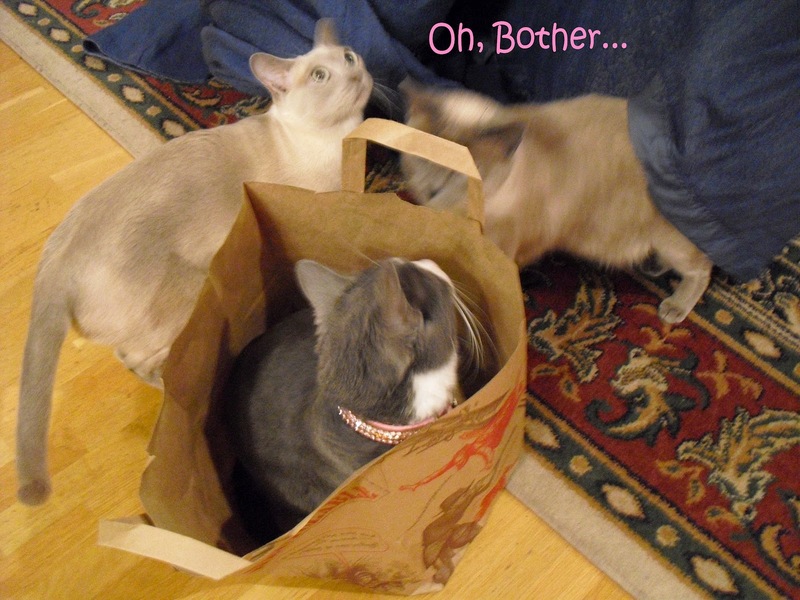 Me too LOVE to play in bag´s without any disturbing brofurs ! You have good taste, Allie! It looks like your brothers are too, Allie! Allie, I hope you were able to hide from your brothers, or at least get to stay in your bag. Mom asked me to share that we do not have that Trader place yet... bummer... or Puffy and Fluffy could play with their bags. Looks like you found a great hiding spot! oh Mother had to sign the "Bring Trader Joe's to Kansas City" petition years ago! Crossing paws that you'll get one soon too! Did they knocks the bag over with yous in it!?! Kozmo has done that to me and it makes me MAD!!!! Allie: ooooh Nellie that would make me mad too! It would! I'd have to do some Pink Paw SMACKdown if that had occurred! Allie! Those Boyz needs to get their own bags!! Yeah, allus SOMECATS around ta be bothersome!